WASHINGTON, D.C. - The U.S.-Ukraine Business Council (USUBC) has spoken with Ambassador Oleh Shamshur this afternoon in Washington and offered him our most sincere congratulationson being proposed by President Viktor Yushchenko to be Foreign Minister of Ukraine. The Ambassador leaves for Ukraine later this afternoon. A possible vote on the nomination could take place later this week. The President/CEO of amajor financial company member of USUBC, with over 16 years of experience in Ukraine, said on hearing about the Ambassador Shamshur nomination, "I think a diplomat with Oleh Shamshur's credentials and experience is exactly what Ukraine needs right now during this incredible global turmoil." InFebruary USUBC sponsored two small luncheons for USUBC members with Ambassador Shamshur at the Embassy of Ukraine. The Ambassador has always strongly supported the development of the private business community in Ukraine, U.S. companies investing in Ukraine and has worked very closely with USUBC since being in Washington. USUBC has appreciated the strong support received from Ambassador Oleh Shamshur," according to Morgan Williams, SigmaBleyzer, who serves as USUBC President/CEO. sacked in the aftermath of a row with the prime minister. The president's press service said the candidature of Oleh Shamshur would be submitted to parliament for approval. It was unclear when debate would take place or whether Shamshur, 53, would win sufficient support in the often fractious chamber. long been expected, with the job of finance minister also vacant. A career diplomat, Shamshur, has also served as deputy minister and head ofthe ministry's section dealing with the European Union. As he has been on Washington since 2005, Shamshur has been absent for much of Ukraine's turmoil between Ukraine's pro-Western leadership generally pitting Yushchenko against his estranged ally, Prime Minister Yulia Tymoshenko. 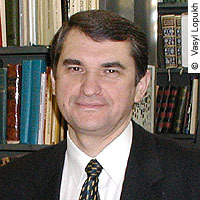 Ukraine's previous foreign minister, Volodymyr Ohryzko, was dismissed by parliament this month after clashing with Tymoshenko. Deputies said he sent a directive to Ukrainian embassies critical of the prime minister. Russia, backs a more moderate, slower approach to closer ties and membership of NATO.